By many stretches, 162 games equates to a lot of baseball. 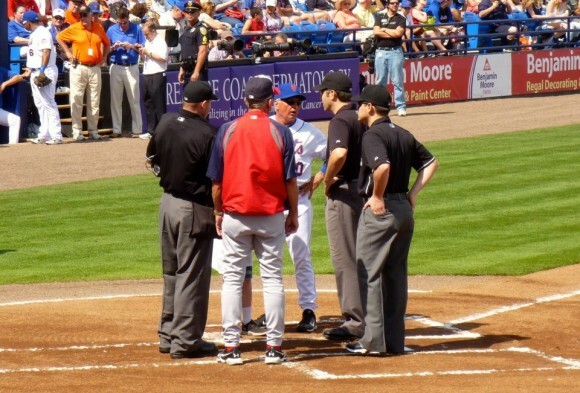 To those who have never categorized months by spring training, regular season and playoffs, baseball appears to cover an overwhelming portion of the calendar year – too much, even. Throw into the mix, for the sake of humor, the fact Davey Johnson is now retired with an astounding 1,372-1,071 managerial record. Yes, on the surface, it all adds up to an exhaustive amount of baseball. And yet, with Corey Brown’s grounder to Arizona first baseman Eric Chavez, the Washington Nationals officially closed out the 2013 season all too soon with a record of 86-76. The Nats’ skipper had predicted earlier in the season that it would take a ball club a minimum of 90 wins to make it to the playoffs. While the Nats’ hopes seemed dashed long before 90 wins became impossible, Game 162 marks an abrupt end to a long season for any team omitted from October baseball – not the least, a team that many projected to win it all this year. Nevertheless, the Nats left the field for the final time in 2013 after falling to the Arizona Diamondbacks 3-2. But, the Nats’ last game had some noteworthy moments. Prior to first pitch, the D-backs honored Johnson, who closed the book on an honorable 17-year managerial career with the Nats’ loss. Tanner Roark provided Washington with yet another solid outing, allowing just one run on three hits and a walk through seven innings pitched. Roark’s dominance allowed the Nats – staffed primarily with reserves – the opportunity to hand Johnson one more win. Roark’s only trouble spot came in the first after Willie Bloomquist singled and Adam Eaton hit a sacrifice bunt, which Roark bobbled allowing the Diamondbacks to hold runners at first and second. Bloomquist came home on a sacrifice fly by Paul Goldschmidt to give Arizona a 1-0 lead they held onto until the sixth. In the meantime, Arizona’s Wade Miley was sharp, shutting down the Nats until that point. 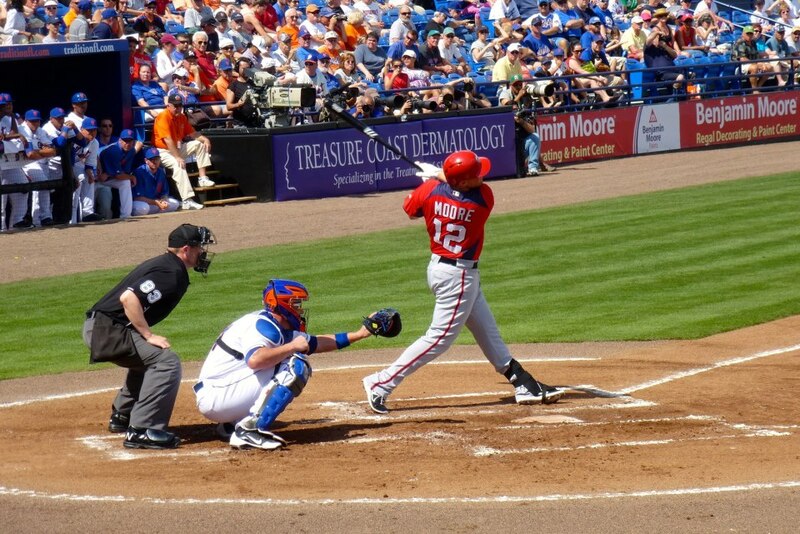 Tyler Moore began the sixth by reaching first on a throwing error. Zach Walters then tripled him home to tie the game before he came home himself on a single by Steve Lombardozzi. That was enough for Roark, who achieved a final line of 7.0 IP, 3 H, 1 R, 1 BB, 3 K with 70 of 95 pitches thrown for strikes. Unfortunately, it wasn’t enough for Ryan Mattheus. After Bloomquist struck out swinging, Eaton and Goldschmidt hit back-to-back singles. Martin Prado’s single made three – and marked the game-tying run. Mattheus forced Aaron Hill to hit a fly ball for out number two, but A.J. Pollock’s RBI single put Arizona on top once and for all, 3-2. It is often said that anything short of a World Series ring represents a disappointment to any and all ball clubs. While a manager to be named will take the reigns on Washington’s “World Series or Bust” mantra next season, seven months stand between the Nats and their next shot at a Curly W.
Washington Nationals manager Davey Johnson will be managing his final game Sunday when the Nats face the Arizona Diamondbacks. With that game, Johnson could very well be closing the book on a 50-year career as a big league player and manager. For now, he’s slated to continue as Senior Advisor to GM Mike Rizzo, but with Johnson, you can never be too sure of what his next role in baseball will be. We know what he’s already done though. Johnson has managed five different clubs, winning six division titles, one pennant and one World Series title. I sat down with Davey and asked him about the season, the Nationals organization going forward, his managerial career coming to a close in Washington and what his future might hold. Craig Heist: Davey, I know this season hasn’t gone the way you wanted it to and barring a miracle finish in the last week, you will miss out on the post season. Do you look at it as a disappointing year for you? Davey Johnson: Well, when you are picked to win and you don’t win, it’s disappointing. Some guys didn’t do what they are capable of, we had a few injuries and we didn’t have a lot of depth to back it up and some strange things happened. The configuration of the ball club was a little bit different and we didn’t make the adjustments needed to be to play well the whole first half. So, it what it is, you know, you’re never happy unless you win. CH: With the talent that is in that clubhouse, if someone were to tell you four months in, you’re hitting .239 as a team and second from the last in the league in runs scored, what are you saying? DJ: Well, I’m saying guys are trying too hard and or approach is wrong but I think a lot of the things we did in 2012 that we didn’t do starting out in ’13 is, we were very aggressive. You know, when Harper came on board everybody was swinging the bats and we were very aggressive and starting in ’13, we were kind of passive. Denard Span was very passive and taking a lot of pitches and I think it just gives the pitcher an advantage. You know, you get behind and they can make tough pitches so, you don’t get on base, you don’t get hits and you don’t score runs. CH: I know how competitive you are. I covered you in two different places now. If it doesn’t work out and because of all the “World Series or Bust” statement before the start of the season, how do you feel about that now? DJ: Well, I feel fine. I don’t think I would do anything different and I think when I think back, because I do put enough thought into everything I do and the players that I play, that it’s the best choice. I am disappointed because I don’t think a lot of guys didn’t play up to their potential early. We did have some shortcomings that we couldn’t overcome. But, be that as it may, it’s still a great franchise, it’s still got a lot of great players and I think they are going to be a whole lot better starting off next year than we were this last year. CH: Because of this (season not going as planned) is there any part of you that would want to do this one more time? DJ: I always love to do it but I’m not even thinking about coming back here. I think its time to turn it over to a younger man and let them run with it. I think everything is in place. I think the organization and the Lerner family has really done a great job building a great foundation, (Mike) Rizzo has been an outstanding GM and I think the future is really bright here and it’s going to be very exciting for somebody to come in here and it’s going to be an awfully good baseball town for years to come. CH: What about you and your plans for the future in terms of being a consultant? DJ: Well, I have a lot of—I have already been offered another job. I have been offered a job in the Florida Collegiate Summer League so they said I can have my old job back when I get down there. I also want to get down there to the Major League Youth Academy in Orlando. Who knows, every time I finish up a season and don’t have anything lined up in the future, somebody calls me and gives me something challenging or whatever, and I’ll be open to all of that. CH: When you look back on your career, what’s the biggest highlight and maybe the biggest disappointment? DJ: I think the highlight obviously was getting to the World Series in my first year as a player and beating the Dodgers in four straight, and the other highlight was managing the Mets to the 1986 championship. I don’t have any memories of any real disappointing things. I would have liked to have been able to stay in New York a little longer and fix things that were going the wrong way but they chose to go in a different direction. But, I have enjoyed the opportunity to be in a lot of different organizations, managed all around the world, and I wouldn’t change much about my career. It’s all been fun. CH: What stands out to you about the direction this organization is going in? DJ: Well, they’ve done everything right. They have built a great ballpark. It’s functionally top drawer. A lot of these people who build ballparks, they’re functionally obsolete right away. The Lerner family does a great deal of charity work for the inner city kids and the military. I mean, they get A-plus grades across the board as far as ownership and they have hired good baseball people and let them run the program. They’ve gotten some good draft picks and they continue to get good draft picks. This is a fine organization and it might be the best of all the ones I’ve been with. CH: With the players this club has at the Major League level and then throughout the organization, what can you say about the stability of the team and organization and where they might look for improvements? DJ: I am happy with what is here and I don’t see the need for a lot of additions in the off-season. That’s good news also because I think there are a lot of good players knocking on the door giving you a lot of insurance at a lot of places where we haven’t had in it in the last year or two. CH: For as frustrating as this year has been in terms of wins and losses, can you look back at it sometimes and say, that’s just the game and that’s the way it is sometimes? DJ: You know, as long as you prepare for every game and you put your best foot forward that day with an eye on tomorrow, I take what this game gives you. I have been very blessed and very fortunate to have a lot of teams play up to their potential and that’s all I can ask of a player and it’s been fun for me. I feel very lucky. The Washington Nationals split Sunday’s day-night doubleheader against the Miami Marlins, but they remain five games out of the second NL Wild Card spot – with just six total games remaining. Dan Haren accumulated the Nats’ loss in Game 1 after giving up a two-run shot to Giancarlo Stanton in the first inning and a solo shot by Christian Yelich in the third. The Nats’ bats, in turn, were quiet. Washington tallied just four hits in Game 1, compared with the Marlins’ 12. And, the very team living on a prayer failed to cross home plate until the sixth after Denard Span walked and Ryan Zimmerman homered. By that point, the Nats were a day late and a dollar short. Donovan Solano’s RBI sacrifice fly in the top of the seventh gave Miami an insurance run to write a 4-2 win in the books. Dave Nichols of District Sports Page and Patrick Reddington and Doghouse from Federal Baseball discuss the Washington Nationals split of a doubleheader with the Miami Marlins, Stephen Strasburg’s future, and the home finale for manager Davey Johnson. In a moment three and a half months in the making, Bryce Harper, Jordan Zimmermann and Davey Johnson at last were announced among the best of the best in Major League Baseball during the 2013 All-Star pregame call-outs. On a night that featured more pomp-and-circumstance than Citi Field has seen in recent weeks, the three quietly took in the moment, wearing smiles befitting of three humble All-Stars of two very different generations. 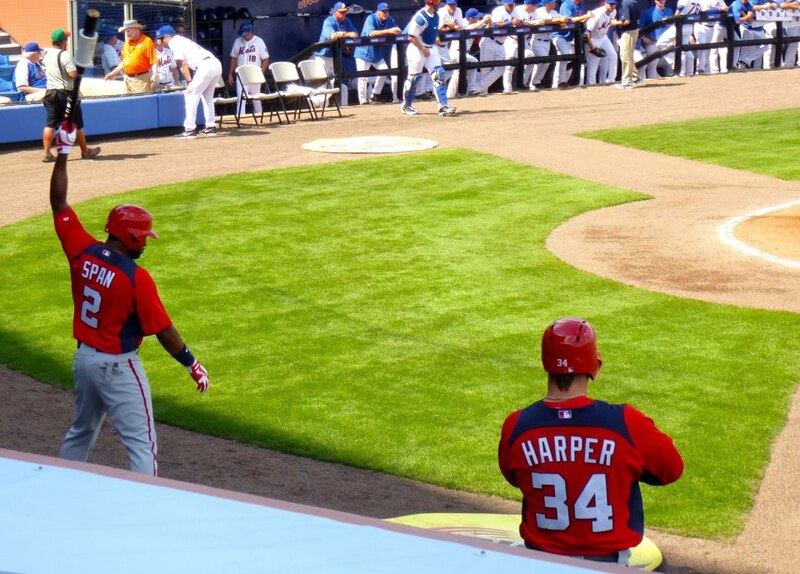 Harper represented the only member of the Washington Nationals to see playing time in the Midsummer Classic. The 20-year-old became the youngest position player to start the All-Star Game since Ken Griffey did so in 1990. In his second All-Star appearance, Harper went 0-for-2 on the night, lining to Miguel Cabrera off Chris Sale in the third inning and popping to J.J. Hardy off Grant Balfour in the sixth. He also recorded four put-outs for the National League, including a first-inning Chris Davis fly ball and saw more playing time than any other NL player, save for the New York Mets’ David Wright. A natural in the limelight – unlike his 27-year-old teammate – Harper handled the 48-hour media frenzy with poise. Zimmermann remained comparatively quiet, never throwing a pitch in the game due to lingering neck soreness. But, when it all came down to it, the night belonged to New York Yankees closer, Mariano Rivera. There is an old saying baseball that goes something like this: you are going to win 60, you are going to lose 60, and it’s what you do with the rest of the games that count. Entering a four-game series with the Philadelphia Phillies this week, the Nationals had won six of their previous eight games, including four straight and a sweep of the San Diego Padres over the weekend at Nationals Park. But the trip to Philly, and three straight starts against left-handed pitching, didn’t go quite the way the Nats hoped as the team dropped three out of the four games in the series to start a seven-game road trip that concludes with a three-game series in Miami against the Marlins and the All-Star break. As we all know, the baseball season is full of ups and downs, winning streaks and losing streaks, but the defending National League East Champions are at a crossroads a few games into the second half the season. The Nats are currently ranked 13th in the National League offensively. They are next-to-last in the league in fielding, with only the Los Angeles Dodgers behind them. They are, however, fifth in pitching and in the end, that will be their saving grace if they are to make a playoff run. This is a team that was picked by many of the prognosticators to repeat as N.L. East champs, but they find themselves six games behind the Braves — and just 1 1/2 games ahead of Philly in third place — as the final weekend of play before the All-Star break is upon us, with over 90 games already in the books. To make matters worse, the Nats trail both Pittsburgh and Cincinnati for a Wild Card spot in the playoffs. Yet, there is no panic within the clubhouse and much of that has to do with skipper Davey Johnson. In some ways, Johnson has to feel like this is 1996 all over again. That year, his Orioles were at 50-51 on July 26 and yet the Birds found a way to get hot, win 88 games, and win the Wild Card in the American League, eventually losing to the Yankees in the ALCS in five games. Johnson has always liked this team despite its inconsistency in the first half and he is well aware through a long baseball season anything can happen. The key for Johnson and the Nationals is to ride out the storm and try to stay within striking distance of the Braves and take a run at them in August and September. Fans are becoming worried and with good reason. They look at the standings and see their team’s position and wonder what how does this team right the ship. It’s nothing that a nice seven or eight game winning streak wouldn’t cure, right? Two years ago, the Red Sox had a nine-game Wild Card lead over the Tampa Bay Rays on Sept. 3 and wound up losing the Wild Card on the final day of the regular season. Also that year, the Braves lost a 12-game Wild Card lead to the Cardinals with six weeks to play. Stranger things have happened so the Nationals try to keep their current dilemma in perspective. Johnson and the Nationals would like to feel a lot better. Following the Washington Nationals 6-1 win over the Philadelphia Phillies, manager Davey Johnson told the assembled media the team would place LHP Ross Detwiler on the disabled list, retroactive to May 16, and call up LHP Xavier Cedeno from Triple-A Syracuse. Detwiler had a bullpen session Saturday, but Johnson said Detwiler’s side was still “very tight” following the workout and will be put on the D.L. Cedeno, picked up on waivers from the Houston Astros, is on the 40-man roster so there doesn’t need to be a corresponding move. The 26-year-old lefty has made 52 appearances at the big league level, with an 0-1 record, 6.00 ERA and 1.744 WHIP over three seasons with the Astros. This season for Syracuse, he’s pitched in 10 games. He has a 1-0 record with one save, a 1.74 ERA and 0.968 WHIP in 10 1/3 innings. he’s walked three and struck out 14 batters. In other injury news, Johnson said OF Bryce Harper re-aggravated a knee injury sliding into second base in Sunday’s game and will probably miss a couple of days, though Harper told reporters he doesn’t think he’ll have to miss much time. Harper also told reporters it’s an issue he’ll have to deal with this season and get fixed once the year is over. Washington Nationals manager Davey Johnson had a couple of injury updates in his pre-game press conference Friday before taking on the Philadelphia Phillies. One injury we knew about was an update — Ryan Mattheus will miss a “couple months” but will not need surgery on his broken hand, sustained last Saturday after he punched a wall following his five earned run with a balk appearance. The other injury news was a surprise, but not really considering the player. Johnson revealed 2B Danny Espinosa sustained a broken bone in his wrist when he was hit by a Paul Maholm fastball late in April and has been playing through the injury since. With Espinosa hitting .163/.196/.291, it’s not shocking to hear this news. Espinosa also has been dealing with a torn rotator cuff in his left (non-throwing) shoulder as well. Johnson indicated that the team would make a move Saturday, returning a reliever to the minors (most likely Yunesky Maya) and calling up a position player from AAA. Johnson was specific that Anthony Rendon is not being considered for a recall. For now, it appears the Nats will allow Espinosa to sit for a few days to see if that will help with the pain in the wrist. Among the candidates for recall are Will Rhymes (.299/.366/.344 in 178 PAs at AAA), Jeff Kobernus (.333/.378/.420 in 193 PAs) and Zach Walters (.215/.244/.436 with 9 HRs in 181 PAs). None of the three players are on the Nats 40-man roster. If the Nats are content to allow Steve Lombardozzi play everyday until Espinosa either feels better or goes on the D.L., then most likely the move will be Rhymes, a player with Major League experience who is more capable of sitting on the bench and coming in as a pinch-hitter. Walters probably would have been at the top of this list coming out of spring training, but his mostly terrible first two months in AAA probably keeps him there for now. In discussing the maturation of young hitters Ian Desmond and Danny Espinosa, Johnson discussed both players’ transitioning into the players he thought they could be by being the hitters they are, instead of trying to change them into something they aren’t. By focusing on attacking and punishing fastballs (where in the past they were instructed to look for pitches they could take the other way), they’ve grown more confident with their abilities, and with that confidence they’ve become more selective, which in Desmond’s case saw an increase in on-base percentage last season — and Johnson envisions the ame thing for Espinosa this upcoming season. As I’ve pointed out on numerous occasions in the last couple of years, sabermatricians have figured out the key to winning baseball games, but the process gets lost in the romanticization of the game.Winning baseball is all about getting runners on base. Annually, the teams that get the highest number of total base runners led the league in wins. It doesn’t matter really how you get runners on, or really how you get them in. There’s a direct correlation of base runners to wins. Over the past two seasons, the Nats have stressed developing and obtaining players that have good plate disicpline and strong on-base skills. Sometimes that equates to drawing a base on balls. Sometimes, like in Desmond’s case, it means seeing an extra pitch in his first at bat in order to see it coming — and punishing it — in a subsequent at bat. Again, the more runners a team puts on base, the more runs they score — and more games they win as a result. The other thing Davey said was in regards to the pressure of performing with expectations. He said that “pressure is self-imposed.” It’s a very zen-like thing for a baseball manager to say, but he’s absolutely correct. We all face pressure every day in our lives, whether it’s at work, at home, on the roads during your commute, whatever. In that regard we’re no different from Major League Baseball players. How humans deal with that pressure from outside forces is usually described as stress. That stress is what’s self inflicted, and everyone deals with that stress in different ways. For baseball players, that extra level of stress can determine whether that player is destined for the Hall of Fame or doomed to ride the buses in the bush leagues and have to find another avenue to support themselves before they’re in their mid-20s. Some players thrive on it, some wilt. Some feel it and it will affect their performance — positively or negatively — and some are impervious to it. These type of intangibles are the things that sportswriters love. They can’t really be disproven, so they’re free to wax poetic with creative license because how would one go about disproving a “feeling”. There isn’t a statistic that measures how a player copes with stress. It’s an internal thing. Only the player knows. Johnson understands this aspect of the human side of managing people. He could just as well be talking about managing a grocery store or a law firm. By expressing his ultimate confidence in his employees, and not just through public words but by his actions as well, Johnson transfers his confidence to them. Again, it’s not measurable, and these types of things are what still, and probably forever will, drive a stake between sportswriters and sabermetricians. But the players feel it. 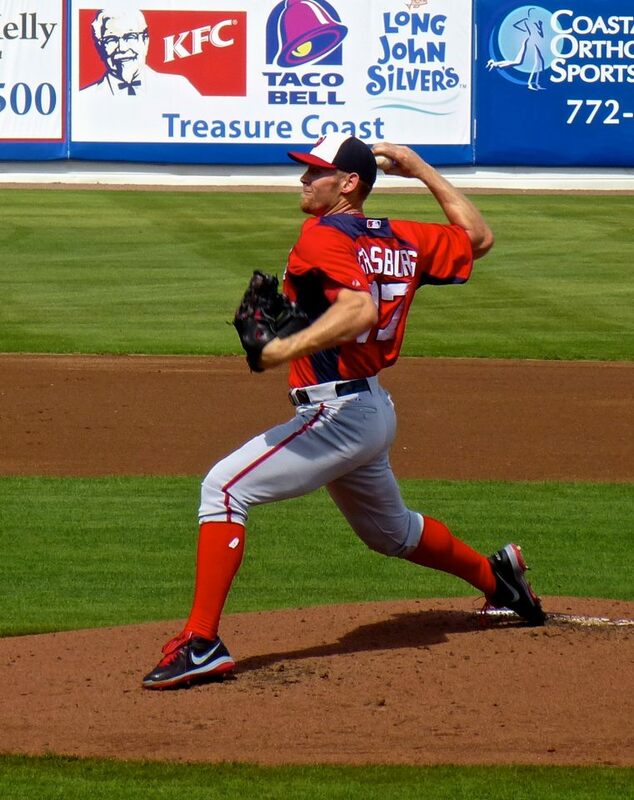 Stephen Strasburg, in his press conference before his opening day start, spoke directly about the confidence level the players feel from their manager. 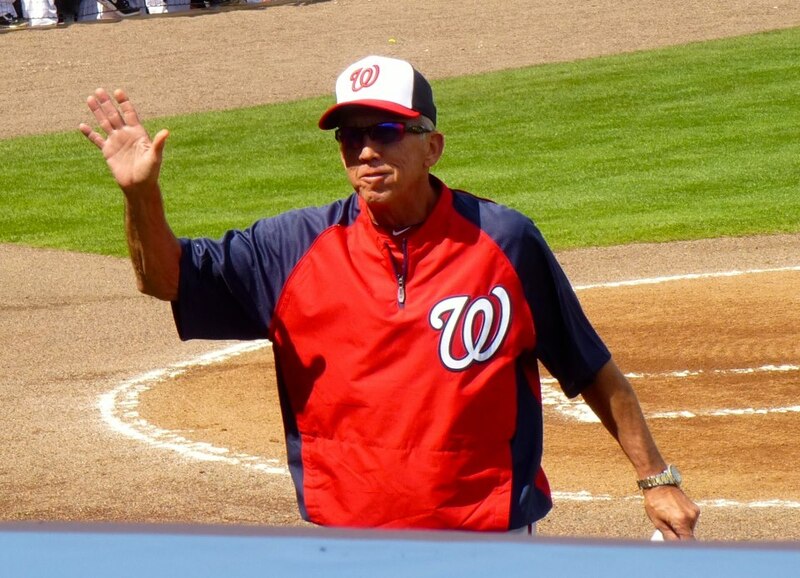 Davey Johnson has the Washington Nationals in a position to succeed, perhaps in a position to challenge for the ultimate test of success baseball has to offer. In his final season as a big league manager, the Nats are molded in his image. The confidence they carry onto the field is a direct reflection of the confidence Johnson carries himself with and instills in his players. 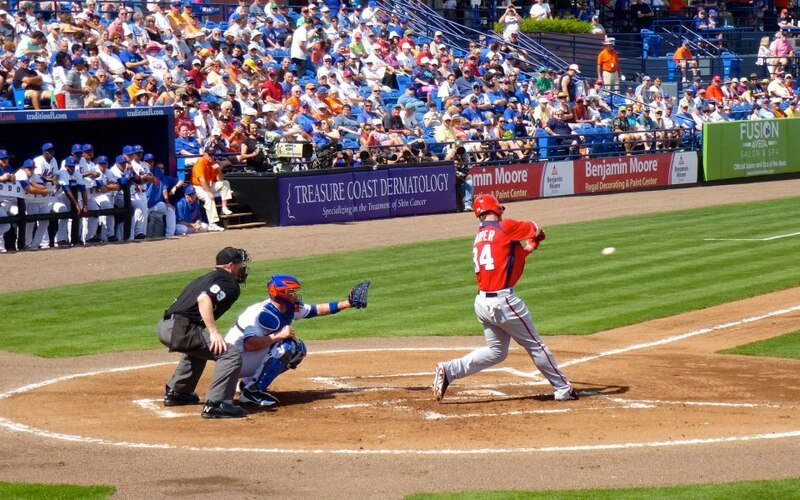 Thanks to District Sports Page fan contributor Luis Albisu (@itsLuisF), please enjoy a photo gallery of Saturday’s Grapefruit League opener, in which the Washington Nationals lost to the New York Mets 5-3 at Tradition Field in Port St. Lucie, FL. 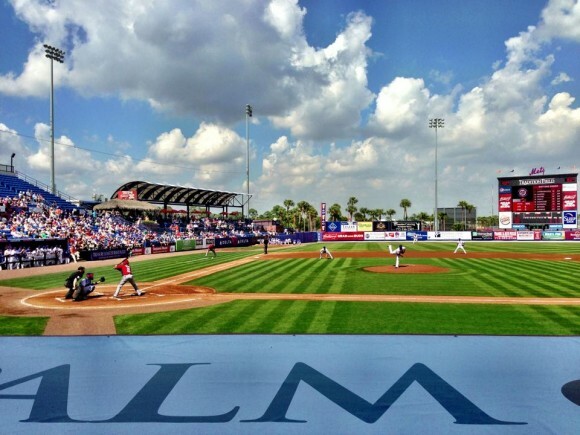 The first pitch of spring training under beautiful azure skies. (photo courtesy L. Albisu).